Earn money, sports and computer Equipment for your school or organization! Earth Month was created for all of us to think about earth issues . It is not only a special mopnth in the town where we live, but a month that many places around the globe celebrate with world related events and earthday celebrations. It is held in April because the orginal Earthday was proclaimed April 22. Many of Earth's citizens celebrate Earth Week (The week of Aoril 22 which varies every year). When is Earth Day and Earth Month? The UN designated The entire month of April every year. What Can You Do for Earth Month? You can participate in one of the existing projects, or start one of your own. Perhaps a small project such as planting a tree, or a large project with your classroom or neighborhood friends such as a park clean up. The possibilities are endless. Try to think of something you would like to do-you too, can make a difference! See our Information pages such as the " tips and tricks" page or "thinking green" page, full of ideas to make Earth Day a meaningful day! 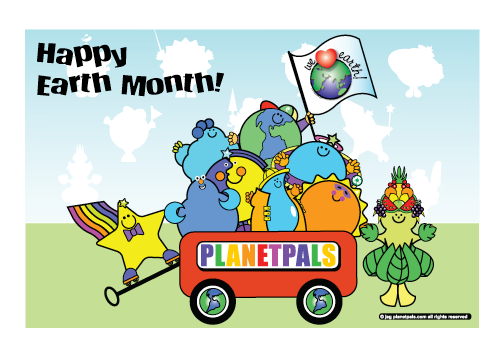 Don't miss our Earth Day Pages for special fun activities, crafts and games to do in celebration of this Earth Day! It's jam packed! 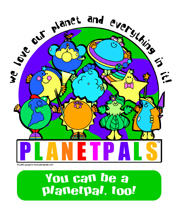 Of course Planetpals makes EVERY DAY, EARTH DAY, and Every Month, Earth Month for you! 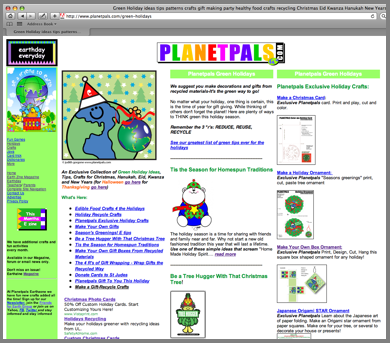 Have loads of fun with the Fun for Kids pages: activities, crafts, games, greetings, clip art and more!